Please note that if you are purchasing on a mobile device, click the tiny arrow top right of your screen for purchasing options. SUBMIT is an exciting now approach to improving attitude and response to stimuli. It is designed to improve submission and is incredibly effective at promoting a softer attitude and body and improved suppleness. 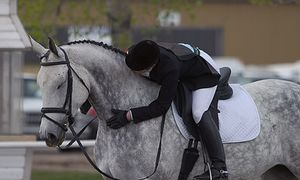 Submit is ideal for retraining, or during times when your horse tends to be tense. It is ideal for all horses but is especially effective on moody mares, colty geldings or horses that have a bolshy or pushy demeanour. Like all calming products, Submit will not calm a grass effected horse. Submit is a unique blend of tryptophan and herbs, and it has a 2 phase effect. After 3-4 hours a traditional calming effect comes into effect, but at around 7 hours submission improves and will have an effect for the rest of the 24 hour period, gently tapering off. We recommend timing the dose for the effect you desire. Submit can be used daily for prolonged periods of time but is not recommended daily for long time use. It is most effective used on an 'as needed' basis. A daily half dose can be effective, increasing to a full dose when needed. Submit is available in 4 different sizes for people who either use it as a one-off dose or consecutive days. If you are experiencing temperament issues with your horse on a daily basis, we advise eliminating grass causes first as grass effected horses generally do not respond well to calming products. If grass is an issue then we highly recommend our other product Graze or Graze Plus. Often temperament issues completely resolve on these products. Other reasons such as possible gastric upset, and pain should also be investigated. We always advise finding the root cause of an issue rather than addressing the symptoms. Submit should not replace correct training.